But the point was brought home to me on a remarkable day this past weekend where I was able to actually push both ends of the size envelope within the same day, from a particularly large brown to a tiny and totally wild rainbow within hours and not more than a kilometre or two of one another. I had received a most gracious invitation from Sharland to join her at Fizantekraal Lodge in the Du Toit’s Kloof mountains. The lodge is top notch, with exquisite views, five star cuisine, and of course in this instance most pleasant and entertaining company. The real attraction though, at least for those of us in possession of “The Fishing Gene” is that it boasts three small trout lakes and a section of pristine trout stream headwater. A tiny, distinctly bushed in and closely wooded top section of the Kraalstroom River. The lake fishing isn’t really my thing, I would have to admit, the dams are too small and the surroundings just a tad too contrived to really sit well with someone who would far rather be on a river or a large expanse of water, bobbing in a boat perhaps or searching the shallows in the hope of finding feeding fish. However on previous visits I had already established a Modus Operandi which makes the fishing considerably more entertaining than might otherwise be the case and Sharland and I have pretty much perfected the technique. The thing is with these small clear dams and large fish sight fishing is more than simply possible, it is virtually assured. 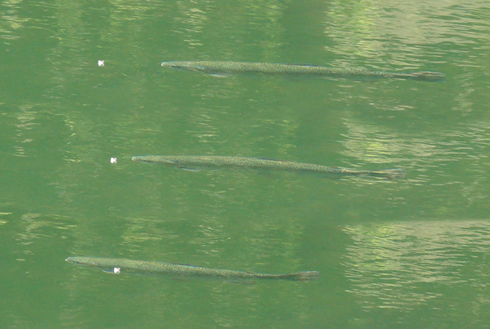 The impoundments despite their small stature contain some really rather large and not entirely stupid fish. They have been stocked mostly in relatively small sizes and grown on without artificial subsidy of diet, they have equally grown more than a little wary of anglers and eschew pretty much any fly or lure that most people would consider standard fare for the lake angler. Woolly Buggers and such are frequently followed but ultimately ignored and the dams therefore provide a wonderful possibilities for experimentation. Even with 7X tippet and #18 dries, refusals prove all too common. 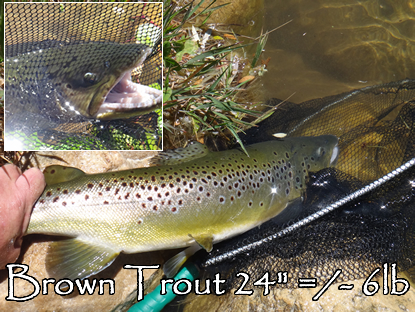 In short having sighted a fish on my way back to the lodge I couldn’t resist the temptation to take a cast, knowing , or at least mostly knowing that you weren’t supposed to throw such tiny flies on such fine tippet at 2 to 3 kilo trout. It isn’t done; but of course I did it and landed a superb fish. In the following hours and on into the next day we repeated the trick over and over. The fish would be very tippet shy and entirely avoid any moving subsurface pattern but would take well presented tiny parachutes.. It was tremendous fun and afforded the chance to push the limits of what was possible. In fact those experiments worked so well that on this trip I didn’t venture to include anything heavier than a three weight rod in my gear. I caught some great fish in similar size ranges and a number of “tiddlers” which had entered the lower dams from the river over time. In fact I rarely fished a nymph at all for the duration of my stay but in the late morning I was returning to the lodge again, feeling more than a little dehydrated as it had become really rather hot and I thought that I would enjoy a drink before a planned trip to fish the river in the afternoon. On the way back there was a sense of De ja vu when there appeared in the shallowest section of the dam a very large fish which boiled at something on the surface. I unhooked the dry on its gossamer tippet, trying to stay hidden behind a large grass tuft I flipped the dry out onto the surface not a few feet from the bank and waited. 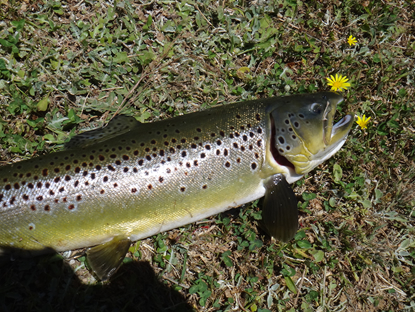 The trout appeared from behind the grass, a massive brownie, spots showing clearly in the sunshine and a simply huge head, with a seriously kyped jaw, broke the surface and engulfed the fly. It was a heart stopping moment, the mouth was so large that I could easily imagine pulling the fly right out of it and hooking nothing but thin air. Really, it seemed impossible to hook up, as though one had tossed the fly into a fire bucket and was hoping to catch up on the sides. I delayed the strike, lifting firmly but not overly quickly and the next moment there was solid resistance and a huge thrashing of foam on the surface as the trout felt the prick of the hook. I removed the hook that was set well back in the giant fish’s throat, actually managing to fit my entire fist into his mouth in the process, a simply massive mouth for a freshwater fish, took a few quick pictures and put him back into the water. Unfortunately he got away from me a bit early before I was happy he was well set and proceeded to dive into a weedbed where I could see him laying, ostrich like, head in the weeds and not looking entirely OK. He was too far out to reach with the net so stripping myself of my vest, glasses and such I dove into the dam after the fish, hoping to get him back in the net or provoke him into swimming away and driving some more oxygen through his gills. He shot off and appeared to recover fully. Soaking wet I returned, probably a little late for lunch. In the afternoon I headed up the Kraalstroom, the first section is impossibly bushy and Lilliputian, you wouldn’t swing a mouse no matter his proverbial adversary but as I walked the odd pocket opened up. 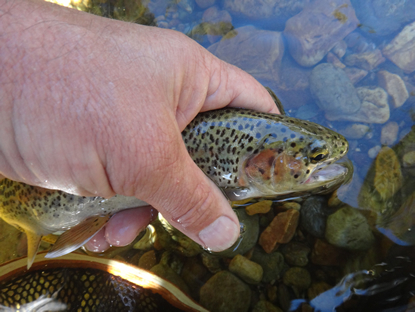 Each time there was a pocket in the rocks there would be a beautiful wild rainbow trout of between six and eight inches sitting right in the tail-out. The difficulty wasn’t so much fooling the fish as getting the fly into the water. I contrived numerous casts, variations of switch. roll, flick and goodness knows what else in the tight brush. Casts which may not appear in Gary Borger’s “Presentation” and would probably be righteously excluded from a book with such a title, but I hit the water often enough and each time I did I hooked a gorgeously marked baby trout. Flushed cheeks and classical metallic blue finger shaped parr markings. Gorgeous little fish, naïve as girls at the school dance and pretty in much the same way too. All dressed up with nowhere to go in the tiny stream. On one occasion, and probably as much through luck as judgement I managed to flick a cast under an overhanging tree, get the leader to settle just before tangling an overhanging bush and as the fly drifted into the shade of entangled herbage a slight flash indicated the take and I hooked into a twelve incher. A monster really from this water and a most satisfying challenge to even get near, I was ecstatic with that result, the fish as deserving of praise and joy as the massive brown of the morning. One fish no more than twelve inches long demanding a dreadfully contrived and somewhat fortuitous cast , the other a leviathan, known of but never or rarely previously hooked in a small dam and landed on the finest of tippets. Beautifully coloured baby bow from the Kraalstroom. As with all the posts on “The Fishing Gene”, you are welcome and encouraged to leave comments. Thanks to the regular readers “The Fishing Gene” blog recently passed the 30,000 views mark and hopefully will continue to grow in popularity. A bad start to the day ends with some experimentation and a lot of fun. Yesterday started a little poorly if I were honest, I was (at least I thought I was), due to be guiding a client on the local streams but we had battled to communicate due to problems with e mails and I was still awaiting confirmation of a pick up point. To cut a long story short, there I was bags packed, water booked, new flies pristine in their boxes, lunch and refreshments at the ready and with a full tank of gas, just no client. Turns out that when he had said “Saturday” I understood it to be this one and he had meant the next one and I finally established that at this very moment he was fishing a thousand kilometers away in another province. Well there wasn’t much for it but to make the most of a bad job and go fishing anyway, you might imagine that this took some considerable time to decide, I think perhaps a nanosecond at least. There were a number of local anglers in the car park, the nature conservation guys got a free packed lunch courtesy of the otherwise occupied and currently absent “client” and after a brief discussion and the standard “tight lines” we were on our way to our various beats. (Water hereabouts is booked on a section by section basis and one can therefore enjoy uninterrupted angling). I did proffer some advice to a relative novice and suggested that he perhaps consider cutting down the diameter of his tippet a bit, it looked as though he was heading out after blue marlin. When I told him I generally fish 7X with the dries he commented that “I can’t use that stuff I just break off all the time”. I didn’t give it too much thought, I was heading for a day alone on the stream and I was looking forward to the experience. Oddly I haven’t fished much for my own account of late and actually by the time I had hiked in to the section I was fishing and allowed the sweat from my brow sufficient time to stop fogging up my polaroids I was more than in the mood for a spot of angling and perhaps a little experimentation as well. One of the great disadvantages of guiding all the time is that one sticks to what is known, practical and within the abilities of the client and that tends to result in a less than experimental outlook. The clients want to catch fish, I want them to catch fish and I thus forego much of the fiddling about that I am apt to enjoy out on the river alone. Of course fiddling about is a rather underrated skill and it can often result in breakthroughs of technique or at the least a bit of fun. I rigged up with a small spun dun, there were no fish moving, the weather was rather variable and I determined that I was going to focus on just getting good drifts and if a fish came up all the better. There is something about a good dry fly drift that can bring joy to one’s heart, even if it goes uninterrupted by the attentions of a trout. I am very much a fan of long leaders and have a tendency to over do things in that department, at least at the start of the day. Sure enough the 7X tippet was a struggle to turn over at the end of 20 feet of mono but I figured I would sort it out as time went on. After all I was fishing, fishing for my own pleasure and there was no pressure. I eventually managed to get the fly to at least hit the water in a slightly troublesome breeze and was contemplating whether I shouldn’t cut the leader back a tad, but then there was that awesome drift of the fly. The slack allowing the spun dun to ride the vagaries of the complex currents as though completely unattached and sure enough a fish thought that it was good enough to eat and promptly did so. A fish in the very first run and I was feeling more than a little chuffed with myself. There was little activity on the water, few rises, large numbers of micro caddis about and the odd mayfly popping off but it was nice to be out and I carried on with my casting and drifting of the fly over likely looking spots. Just having fun and catching some fish. In fact I was enjoying it so much that for no particular reason I decided to fine down even more and put on some 8X tippet, perhaps those words in the car park were sitting deep down in my subconscious. I have taken to fishing 7X as standard, not because one needs to all the time but because then you get used to it, such that if forced to go fine it isn’t a problem. I figured that maybe I should start getting used to the 8X stuff in the same way, if I lost fish it wouldn’t matter. Despite the previously good drifts the soft Stroft 8X produced an immediate improvement, I thought I was getting good presentation before but now it was awesome. The fly would alight like the proverbial thistledown and proceed to ride the currents with uninterrupted ease, just like the naturals that were beginning to show up more and more. A few olives started to come off and I switched to a size 18 BWO parachute, I wouldn’t say that I was hammering the fish, they weren’t really rising but by day’s end I had landed somewhere between 20 and 30 fish, a few of more than respectable size and I had popped the tippet on only one small fish that had charged the pattern with such enthusiasm as to have taken me by surprise causing me to overreact. This Olive parachute worked wonders on the fish, particularly once the BWOs started to come off. I suppose that isn’t entirely extreme, a client recently told me that on his home waters when fishing the trico hatches you have to go down to 10X to have a hope of a take but still most local anglers here don’t go close to that fine. I am not sure if the tippet is much less visible but it certainly does aid in presentation, with soft landings and quality drifts time after time and in the end that has to improve the catch rate. What puts everyone off is the risk of breakage. Firstly you want the hooks razor sharp, you simply cannot apply a massive strike force to such fine nylon, I always sharpen my hooks but take extra care when fishing this fine. (for the record, barbed hooks are hopeless for this game, the barb stops the hook penetrating and you will lose fish after fish if you use them). You want to have a long leader and perhaps a boiled one, the stretch again adds a level of protection from sudden lunges by the fish. You really do need, and may well battle to find, a soft actioned rod. I dislike fast action rods at the best of times and for this work they are hatefully inadequate. I was using a relatively inexpensive Stealth Deep Red #3 weight which is wonderfully good at protecting find nylon. You need a reel that will spin smoothly and you need to develop what cricketers refer to as “soft hands”. Those aren’t the ones you dream about giving you a massage when you get home, they are the ones that allow you to instantly back off pressure and let line run off the reel when needs be. The only way to develop these skills is to force yourself to fish lighter, fish softer and get the feel of it, it is quite remarkable how hard you can play a fish on such gear with some care. Please do also always net the fish, removing a hook without benefit of a net with such fine tippet makes it all to easy to have the fish slip from your hands and end up with a fly in its lip unnecessarily. One final point, it is equally a good idea to glue the leader into the fly line so as not to have any knots. A sudden catch of the leader / flyline joint in one of the snake guides as a good fish makes one last plunge is a recipe for disaster. 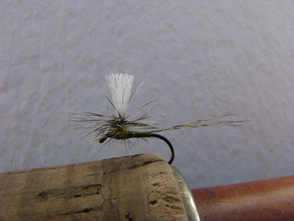 You can download a pdf file on how to make this super glue joint on the following webpage: http://www.inkwaziflyfishing.co.za/Leaders.pdf I am further hoping to post a video clip on how to achieve this joint easily within the next few weeks. Thanks for reading and “tight lines” , if you are fishing fine, just not too tight.